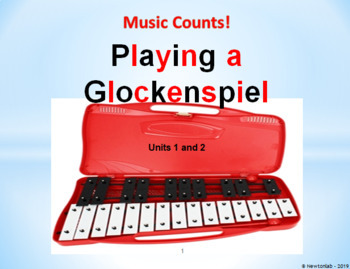 Playing a Glockenspiel Unit 1 teaches students to play glockenspiels correctly, play together at the same time, play the scale of C major and perform simple tunes and songs using lettered score. It can be delivered to a small group, or as many students as you have. Minimum materials are required; you only need glockenspiels. You do not have to have a musical background to teach it. 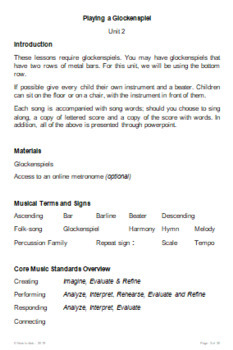 This unit focuses on developing a range of core music standards, (listed below). In addition, the activities aid development of a range of wider skills including focus, team-work, performing and coordination. Students learn about the percussion family and glockenspiels, and are introduced to the musical terms scale, ascending and descending. · a list of core music standards used. 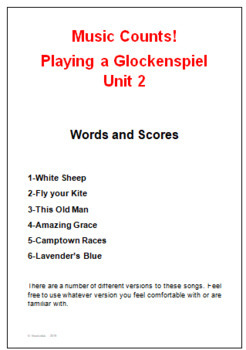 Playing a Glockenspiel Unit 2 builds on the skills learned in Unit 1. 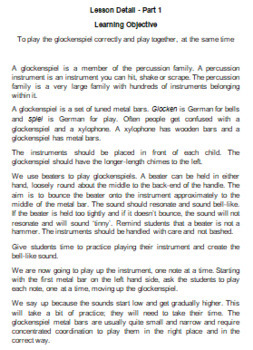 It reinforces how students play glockenspiels correctly, play together at the same time and play songs using notes in the scale of C major using lettered score. This unit teaches children a wider range of lengthier songs including two-part and three-part harmonic pieces. In addition to the terms used in unit 1, students are introduced to and use the musical terms tempo, bar, barline, melody, harmony, hymn and they use the repeat symbol. · a list of the core music standards used.